Can These Hungry Beetles Save Hemlocks In PA And New York? Ln beetles are predatory, and scientists hope that they will spread and eat adelgids off the hemlocks. Sue Tangora is the forest health and cooperative programs section manager for the Michigan Department of Natural Resources Forest Resources Division. She says with 170 million hemlock trees in Michigan, there’s a lot at stake. “Think of the Tahquamenon Falls, that is a state park that is full of hemlock; Porcupine Mountains. These are places that would drastically change,” she says. She points to the Smoky Mountains and the Appalachians, where the adelgid has destroyed hemlocks. “When you look at some of those pictures, you see a landscape that’s been devastated with lots of dead trees, and they found it leads to increased erosion, increased water temperatures, and these domino effects that contribute to impacts on fisheries and wildlife,” says Tangora. In Pennsylvania, land stewards are trying a new approach to control the invader. We visited Bear Run Nature Preserve to see the insectary. It’s essentially a nursery habitat where you grow insects. Charles Bier took me on a walk in the woods at the Bear Run Nature Preserve. He’s the Western Pennsylvania Conservancy’s Director of Conservation Science. The Eastern hemlocks here have come under attack. Bier stops at a graceful, pyramid-shaped evergreen. But some of the hemlock’s soft, flat needles are looking a little sparse. Bier looks at their underside. “You can see right there, that’s definitely hemlock wooly adelgid,” he says. They look like tiny white balls of cotton, clinging where the stem meets the base of the hemlock’s short needles. Adelgids are native to Japan. They were first found in the eastern U.S. around 1950. The insect has killed trees in the southern Appalachians and Great Smoky Mountains. It has infested trees in four counties in West Michigan. Bier says once adelgids find it, a tree might only last a few years. Eastern hemlocks grow near streams, and provide shade for brook trout. Many birds and insects rely on hemlock habitat. There is an insecticide that helps control adelgids. But it’s labor intensive and expensive. 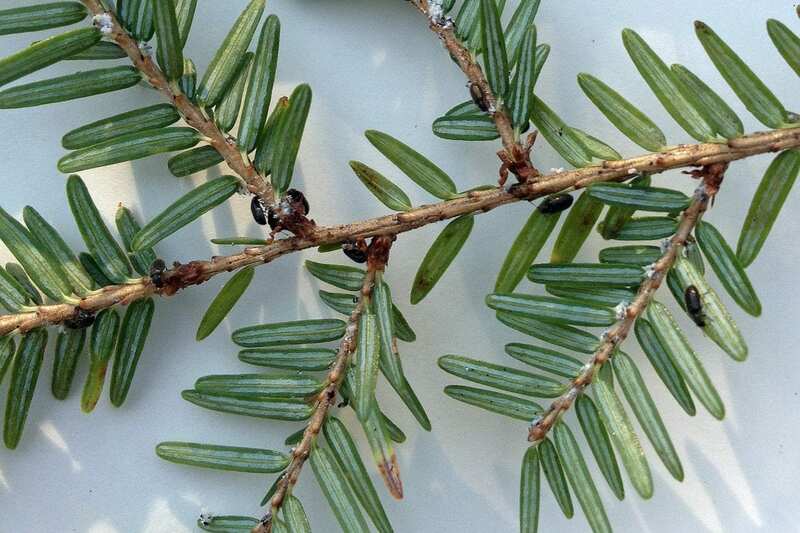 (In Michigan, the DNR’s Sue Tangora says the insecticide is working on hemlocks, but if the infestation grows, she says they might need to consider other management tools). This is where the insectary comes in. The insectary at Bear Run doesn’t look like much now. The Conservancy’s Andy Zadnik shows me where volunteers recently planted small hemlock shrubs. They’re protected by orange fencing to keep deer out. “What do we have? Yeah, 12 little hemlocks,” he says, taking a look around. The Conservancy is taking care of these hemlocks with state foresters. They’re preparing them to be purposely infected with adelgids. “Essentially one year from now, in March, we’ll consider actually starting to infect them, if we think they’re healthy enough,” says Bier. This idea comes from research at Cornell University, where they’ve been releasing a new predator beetle into infested hemlock groves. The Laricobius nigrinus or Ln beetle aggressively eats hemlock woolly adelgids. If the adelgids take hold in the nursery, the Conservancy will introduce the Ln beetle to feed on them, and once they’ve raised a population of Ln beetles, they can release them more widely into the nature preserve. Ln beetles are native to the Pacific Northwest and northern Rocky Mountains, and they already exist in eastern Pennsylvania. But they are not native to this area. “We just need to get this predator here in time to stop the hemlocks from dying in large numbers,” says Bier. But is it really a good idea releasing a new, non-native species here? Mark Whitmore is a forest entomologist from Cornell University. He says researchers have already learned the hard way about unintended consequences of biological solutions. In an attempt to save oak trees from gypsy moths, scientists released a parasitic European fly into the wild to feed on gypsy moths, but it also killed wild giant silk moths in huge numbers. Whitmore’s been working with the USDA on regulations for releasing Ln Beetles to prey on adelgids. Researchers say they can’t be certain, but Ln beetles appear to be containing the woolly adelgid in some areas, and that gives them hope for the Eastern hemlock.